It has been several weeks since President Barack Obama first increased sanctions on Iran, effectively cutting off Iran’s central bank from the global economy. To this point, the evidence is overwhelming that these sanctions have had a strong effect on Iran’s economy and government. Iranian buyers cannot obtain dollars or euros, forcing them to offer letters of credit in alternative currencies such as the Indian rupee, Korean won and Russian rubles. Most steel traders, wary of currency risk and taxation issues, are not willing to accept this form of payment. ‘Now you can really feel the effects of the sanctions imposed by the U.S. and Europe…It is very difficult to do any business with Iran at the moment,’ a steel trader at a Swiss metals trading house said. Iran could be forced to place unsold barrels into floating storage or even shut in production in the second half of this year, the IEA said on Friday in its monthly Oil Market Report. ‘International sanctions targeting Iran’s existing oil exports do not come into effect until July 1, but they are already having an impact on crude trade flows in Europe, Asia and the Middle East,’ it said. ‘Although there are five months before restrictions on existing contracts take effect, European customers have already curtailed imports of Iranian crude and Asian buyers are lining up alternative sources of supply,’ the IEA said, adding that European customers were likely to look to Russia, Iraq and Saudi Arabia for replacement barrels. Bloomberg added that owners of over 100 supertankers have now said they will stop loading oil supplies from Iran. These sanctions, Ross said, are the crippling sanctions Israel has called for, and can affect Iran’s behavior. When the Iranians feel they are under sufficient pressure, they look for a way to reduce it, Ross said, and right now they are under pressure they have not been under before. ‘It’s not an accident that suddenly they want to meet with the P5 +1,’ Ross said, referring to the forum of five permanent members of the U.N. Security Council plus Germany. Iran cannot do business with or obtain credit from any reputable international bank, nor can it easily insure its ships or find energy investors. According to Iran’s oil ministry, the energy sector needs more than $100 billion in investments to revitalize its aging infrastructure; it now faces a severe shortfall. Now, with Iran feeling the pressure, its leaders suddenly seem prepared to talk. Of course, Iran’s government might try to draw out talks while pursuing their nuclear program. But if that is their strategy, they will face even more onerous pressures, when a planned European boycott of their oil begins on July 1. 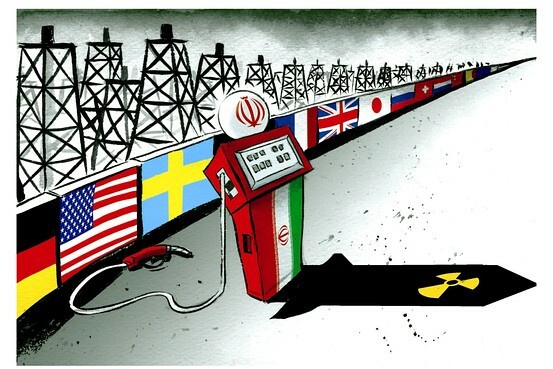 As sanctions continue to take effect, international pressure will only continue to increase against Iran’s nuclear program. Fourteen frustrated members of the U.N. Security Council pointed a finger at the United States Tuesday for blocking any condemnation of Israel’s accelerated settlement construction in Palestinian territory…. While the United States was not mentioned by name, the diplomats anger was clearly directed at Washington which vetoed a resolution in February backed by the 14 other council members that would have demanded an immediate halt to all settlement building. The Obama administration has also promised to veto any Security Council resolution supporting Palestine’s bid to become the 194th member of the United Nations. The United States also opposes Security Council action on “final status issues” because this “would only harden the positions of both sides and make the resumption of negotiations more difficult,” Knopf said. President Barack Obama’s Ambassador to the United Nations Susan Rice has been working intensely to ensure that Israel receives fair treatment in UN bodies and is not singled out for criticism. Rice was recently honored by the Conference of Presidents of Major American Jewish Organizations and spoke about her work to defend Israel in UN bodies. We have made very clear to a lot of countries … that we think this is counterproductive. I’m disappointed, frankly, that we haven’t had more success, but it has been in our engagement at the highest levels. We continue to believe that the best path to the long-term security of Israel and the stability of the region is the committed pursuit of comprehensive peace. … As the recent Quartet statement of the United Nations, Russia, the European Union, and the United States made clear, at a moment of upheaval across the region, serious negotiations toward peace remain essential. …We are committed to ensuring that political changes on Israel’s borders do not create new dangers for Israel or the region. By working for orderly transitions, we believe we can help ensure Israel’s long-term security just as we can support governments that are more responsive to their people.